The University of Missouri-St. Louis is such a diverse campus that it’s so important we keep ourselves educated. One of the ways UMSL helps our faculty and staff do this is with the Office of Diversity, Equity, and Inclusion. This office helps keep our educators inclusive and they are constantly educating everyone with events such as diverse panels and guest speakers. 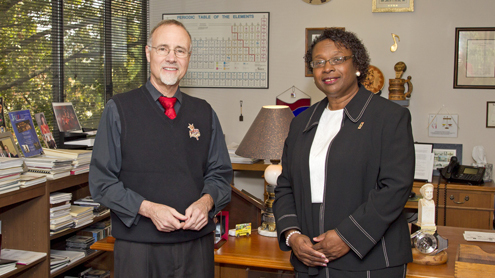 Last fall, the Office of Diversity offered a course to UMSL faculty and staff. It was named UMSL Diversity 101 and was offered online to suit our faculty and staff’s busy schedules. Different departments were able to converse with each other about the content of the course to create a better campus culture. These are some pretty great benefits that ensure our educators have diverse knowledge they can share with us! Some of the participants included Ted Ficklen, senior library information specialist and Diana Redden, senior recruitment coordinator. Both attendees felt that this course helped them expand their knowledge on what diversity was and how it plays a role on UMSL’s campus. “I think this course helped me understand the potentially huge variety of diversities, not just racial or cultural or religious, but gender and sexuality and politics. Not to mention the importance of being openminded about diversities I haven’t even heard about,” said Ficklen. It’s so important for our faculty and staff to know about different types of diversity, not just on UMSL’s campus, but everywhere. This course was able to give UMSL a comradery to learn about diversity in an open environment. Redden talked about how she felt the course brought many people together from different areas of UMSL. “I benefited from the diversity course in a number of ways- It allowed me to see my own privileges as an able-bodied African American woman… I completed the course feeling a sense of responsibility in sharing terminology and related course information with my colleagues,” said Redden. Not only is this course helping our educators that took the course, but they are also sharing the information with people that they know! This proves that UMSL is truly a great learning environment for us and our faculty and staff are especially interested in caring for the educational community. Some of the faculty members talked about whether they want to take any more courses like that again. “I’d certainly be interested in taking more Diversity courses on campus. The [Diversity 101] was a very good introduction. But it was mostly an online course and I’d enjoy a face to face class more, I think. There have been a lot of good diversity activities on campus this month and I am looking forward to more in the coming year,” said Ficklen. “I’m currently not enrolled in any classes like the Inaugural Diversity Course, but would love to take a course similar in the future,” said Redden. So far, this course has been a great introductory course for diversity on UMSL’s campus. Deborah Burris, Director of The Office of Equal Opportunity and Chief Diversity, shared that the course will be available in the fall of this year. It is open to anyone on UMSL’s campus so you will have a chance to take UMSL Diversity 101 course. Make sure to keep an eye out for the course on Diversity’s page!